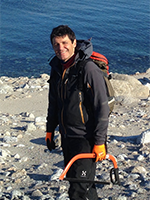 Dr Marc Macias-Fauria is an ecologist who focuses on cold environments. His research is mostly directed at understanding the coupling of physical and biological systems (biogeoscience). He employs long-term ecological records and modelling to understand ecological and biogeographic processes as they are constrained by the physical environment. He gained a degree in Biology at the University of Barcelona, an MSc at the Department of Biological Sciences, University of Calgary, and a PhD at the Department of Geology (now Department of Geosciences & Geography), University of Helsinki, where he studied the climate controls on boreal forest wildfires, tree-growth, and insect outbreaks. This project constitutes a 5-year NERC Independent Research Fellowship and aims at answering questions related to the effects of Arctic sea ice on climatic and ecological processes by producing a pan-Arctic, spatially explicit Arctic Sea ice reconstruction for the Holocene using a suite of environmental proxies, and focusing on the unique characteristics of driftwood as a source of past information on sea ice extent and drift routes. Reconstructed sea ice extent and dynamics will be compared with genetic structures of many arctic populations that point to sea ice as a main driver of their dynamics, and modeled in sea ice and climatic models to quantify the coupling between sea ice and Arctic and hemispheric climate. A wide network of collaborators in this project includes researchers from the United Kingdom, Finland, Sweden, Norway, Denmark, Canada, Belgium, and Spain. Further information on the project will shortly be available. Terrestrial vegetation in the Arctic has shown in the recent decades a strong increase in productivity, which has been linked to increasing growing season temperatures and receding sea ice. This signal, termed 'greening of the tundra', is far from homogeneous and varies spatially with substrate, topography, and land use. We study the mechanisms leading to vegetation change in the Arctic tundra, with a strong emphasis on both physical environmental processes and grazing. Although our scope is pan-Arctic, most of our research takes place in Eurasia, mostly in Fennoscandia and Siberia. This research is done in collaboration with research groups from Finland (Arctic Centre), Sweden, Russia, and the United Kingdom. Increasing availability of remote sensing and biodiversity data provides ecologists with an unprecedented wealth of information that can be used to assess at very large scales (continental to global) and high resolutions the status of our planet's ecosystems. Our work aims at investigating the ways in which such information can be extracted in the form of realistic estimates. This research line employs large datasets of geo-referenced data and is done in collaboration with research groups at the Long-term Ecology Lab (University of Oxford) and the University of Bergen (Norway). The transition between montane sub-alpine forest and alpine treeless environments is considered a 'cold ecotone', that is, an ecological transition mediated by low temperatures, especially in the growing season. We study the mechanisms of treeline formation from a spatially explicit, high-resolution approach, using geomorphology, remote sensing, climatology/meteorology, and intense fieldwork and computer modelling to tease apart the different processes finally determining the position of the forest edge and, in general, of trees on slopes. Our results show that many processes other than temperature alone explain treeline position, and that understanding them is key to plan future scenarios of montane forest. Our approach is global, although most of our research is performed in the Canadian Rocky Mountains, in collaboration with the Biogeoscience Institute at the University of Calgary. Dr Macias-Fauria contributes to the core 'Methods and Techniques in Physical Geography' and 'Earth System Processes' courses for the Preliminary Examination. He also shares teaching of the Final Honour School Option foundational courses 'Earth System Dynamics' and the optional subject 'The Quaternary Period: Natural and human systems'. He lectures the core module on 'Biodiversity Response to Climate Change' and contributes to the core module 'Conservation Biogeography' within the MSc Biodiversity, Conservation and Management. He lectures on 'Earth Observation' to the NERC Doctoral Training Programme students. Andrew Martin (DPhil) Can soil nutrients provide a limit on recent Arctic greening? An assessment of the progressive nitrogen limitation hypothesis in high-latitude tundra landscapes (co-supervised with Prof Kathy Willis and Dr Elizabeth Jeffers; registered in Zoology, Oxford). Marcus Spiegel (MPhil) Disentangling the influence of climate change and land management in the Siberian tundra. Barrio, I.C., Linden, E., Te Beest, M., Olofsson, J., Rocha, A., Soininen, E.M., Alatalo, J.M., Andersson, T., Asmus, A., Boike, J., Brathen, K.A., Bryant, J.P., Buchwal, A., Bueno, C.G., Christie, K.S., Denisova, Y.V., Egelkraut, D., Ehrich, D., Fishback, L., Forbes, B.C., Gartzia, M., Grogan, P., Hallinger, M., Heijmans, M.M.P.D., Hik, D.S., Hofgaard, A., Holmgren, M., Hoye, T.T., Huebner, D.C., Jonsdottir, I.S., Kaarlejarvi, E., Kumpula, T., Lange, C.Y.M.J.G., Lange, J., Levesque, E., Limpens, J., Macias-Fauria, M., Myers-Smith, I., van Nieukerken, E.J., Normand, S., Post, E.S., Schmidt, N.M., Sitters, J., Skoracka, A., Sokolov, A., Sokolova, N., Speed, J.D.M., Street, L.E., Sundqvist, M.K., Suominen, O., Tananaev, N., Tremblay, J.P., Urbanowicz, C., Uvarov, S.A., Watts, D., Wilmking, M., Wookey, P.A., Zimmermann, H.H., Zverev, V. and Kozlov, M.V. (2017) Background invertebrate herbivory on dwarf birch (Betula glandulosa-nana complex) increases with temperature and precipitation across the tundra biome. Polar Biology, 40: 2265-2278. Binney, H., Edwards, M., Macias-Fauria, M., Lozhkin, A., Anderson, P., Kaplan, J., Andreev, A., Bezrukova, E., Blyakharchuk, T., Jankovska, V., Khazhina, I., Krivonogov, S., Kremenetski, K., Nield, J., Novenko, E., Ryabogina, N., Solovieva, N., Willis, K. and Zernitskaya, V. (2017) Vegetation of Eurasia from the last glacial maximum to present: key biogeographic patterns. Quaternary Science Reviews, 157: 80-97. Epstein, H.E., Bhatt, U.S., Raynolds, M.K., Walker, D.A., Forbes, B.C., Macias-Fauria, M., Loranty, M., Phoenix, G. and Bjerke, J. (2017) Tundra Greenness [in “State of the Climate in 2016”]. Bulletin of the American Meteorological Society, 98(8): 145-147. Hole, G.M. and Macias-Fauria, M. (2017) Out of the woods-driftwood insights into Holocene pan-Arctic sea ice dynamics. Journal of Geophysical Research: Oceans, 122(9): 7612-7629. Macias-Fauria, M., Karlsen, S.R. and Forbes, B.C. (2017) Disentangling the coupling between sea ice and tundra productivity in Svalbard. Scientific Reports, 7. 8586. Martin, A.C., Jeffers, E.S., Petrokofsky, G., Myers-Smith, I. and Macias-Fauria, M. (2017) Shrub growth and expansion in the Arctic tundra: an assessment of controlling factors using an evidence-based approach. Environmental Research Letters, 12. 085007. Macias-Fauria, M. (2016) Tundra-Taiga Biology: Human, Plant and Animal Survival in the Arctic. By R. M. M. Crawford. Oxford and New York: Oxford University Press. $125.00. ix + 270 p.; ill.; index. ISBN: 978-0-19-955940-4. 2014. The Quarterly Review of Biology, 91(2): 211-212. Seddon, A.W.R., Macias-Fauria, M., Long, P.R., Benz, D. and Willis, K.J. (2016) Sensitivity of global terrestrial ecosystems to climate variability. Nature, 531: 229-232. Wolter, J., Lantuit, H., Fritz, M., Macias-Fauria, M., Myers-Smith, I. and Herzschuh, U. (2016) Vegetation composition and shrub extent on the Yukon coast are strongly linked to ice-wedge polygon degradation. Polar Research, 35. 27489. Epstein, H.E., Bhatt, U.S., Raynolds, M.K., Walker, D.A., Bieniek, P.A., Tucker, C.J., Pinzon, J., Myers-Smith, I.H., Forbes, B.C., Macias-Fauria, M., Boelman, N.T. and Sweet, S.K. (2015) Tundra Greenness. In, NOAA Climate Program Office (ed.) Arctic Report Card 2015. NOAA Climate Program Office. Hannemann, H., Willis, K.J. and Macias-Fauria, M. (2015) The devil is in the detail: unstable response functions in species distribution models challenge bulk ensemble modelling. Global Ecology and Biogeography, 25(1): 26-35. Macias-Fauria, M. and Kettunen, M. (2015) Arctic ecosystem services. Chapter 2 in, CAFF 2015 (ed.) The Economics of Ecosystems and Biodiversity (TEEB) Scoping Study for the Arctic. Conservation of Arctic Flora and Fauna, Akureyri. pp. 32-50. ISBN: 978-9935-431-46-2. Myers-Smith, I.H., Elmendorf, S.C., Beck, P.S.A., Wilmking, M., Hallinger, M., Blok, D., Tape, K.D., Rayback, S.A., Macias-Fauria, M., Forbes, B.C., Speed, J.D.M., Boulanger-Lapointe, N., Rixen, C., Lévesque, E., Schmidt, N.M., Baittinger, C., Trant, A.J., Hermanutz, L., Collier, L.S., Dawes, M.A., Lantz, T.C., Weijers, S., Jørgensen, R.H., Buchwal, A., Buras, A., Naito, A.T., Ravolainen, V., Schaepman-Strub, G., Wheeler, J.A., Wipf, S., Guay, K.C., Hik, D.S. and Vellend, M. (2015) Climate sensitivity of shrub growth across the tundra biome. Nature Climate Change, 5: 887-891. Seddon, A.W.R., Macias-Fauria, M. and Willis, K.J. (2015) Climate and abrupt vegetation change in Northern Europe during the Lateglacial and Holocene. The Holocene, 25(1): 25-36. Willis, K.J., Seddon, A.W.R., Long, P.R., Jeffers, E.S., Caithness, N., Thurston, M., Smit, M.G.D., Hagemann, R. and Macias-Fauria, M. (2015) Remote assessment of locally important ecological features across landscapes: how representative of reality? Ecological Applications, 25: 1290-1302. Macias-Fauria, M., Seddon, A.W.R., Benz, D., Long, P.R. and Willis, K.J. (2014) Spatiotemporal patterns of warming. Nature Climate Change, 4: 845-846. Myers-Smith, I., Hallinger, M., Blok, D., Sass-Klaassen, U., Rayback, S., Weijers, S., Trant, A., Tape, K., Naito, A.T., Wipf, S., Rixen, C., Dawes, M.A., Wheeler, J., Buchwal, A., Baittinger, C., Macias-Fauria, M., Forbes, B.C., Lévesque, E., Boulanger-Lapointe, N., Beil, I., Ravolainen, V. and Wilmking, M. (2014) Methods for measuring arctic and alpine shrub growth: A review. Earth-Science Reviews, 140: 1-13. Seddon, A.W.R., Mackay, A.W., Baker, A.G., Birks, H.J.B., Breman, E., Buck, C.E., Ellis, E.C., Froyd, C.A., Gill, J.L., Gillson, L., Johnson, E.A., Jones, V., Juggins, S., Macias-Fauria, M., Mills, K., Morris, J.L., Nogués-Bravo, D., Punyasena, S.W., Roland, T.P., Tanentzap, A.J., Willis, K.J., et al. (2014) Looking forward through the past: identification of 50 priority research questions in palaeoecology. Journal of Ecology, 102(1): 256-267. Epstein, H.E., Bhatt, U.S., Walker, D.A., Raynolds, M.K., Bieniek, P.A., Comiso, J., Pinzon, J., Tucker, C.J., Polyakov, I.V., Jia, G.J., Zeng, H., Forbes, B.C., Macias-Fauria, M., Xu, L., Myneni, R., Frost, G.V., Shaver, G.R., Bret-Harte, M.S., Mack, M.C. and Rocha, A.V. (2013) Vegetation. In, NOAA Climate Program Office (ed.) Arctic Report Card: Update for 2013. NOAA Climate Program Office. Helama, S., Holopainen, J., Macias-Fauria, M., Timonen, M., Mielikäinen, K. (2013) A chronology of climatic downturns through the mid and late Holocene - tracing the distant effects of explosive eruptions from palaeoclimatic and historical evidence in Northern Europe. Polar Research, 32(15866). Macias-Fauria, M. and Johnson, E.A. (2013) Warming-induced upslope advance of sub-alpine forest is severely limited by geomorphic processes. Proceedings of the National Academy of Sciences of the United States of America, 110(20): 8117-8122. (Highlighted by PNAS; Commentary on this paper in PNAS). (Cover)..
Macias-Fauria, M. and Willis, K.J. (2013) Landscape planning for the future: using fossil records to independently validate bioclimatic envelope models for economically valuable tree species in Europe. Global Ecology and Biogeography, 22(3): 318-333. Willis, K.J., Macias-Fauria, M., Gasparatos, A. and Long, P. (2013) Identifying and mapping biodiversity: Where can we damage? In, Helm D. and Hepburn C. (eds.) Nature in the Balance: The Economics of Biodiversity. Oxford University Press, Oxford. pp. 57-78. ISBN: 978-0-19-967688-0. Macias-Fauria, M., Forbes, B.C., Kumpula, T. and Zetterberg, P. (2012) Eurasian Arctic greening reveals teleconnections and the potential for novel ecosystems. Nature Climate Change, 2: 613-618. (Cover). Macias-Fauria, M., Grinsted, A., Helama, S. and Holopainen, J. (2012) Persistence matters: estimation of the statistical significance of paleoclimatic reconstruction statistics from autocorrelated time series. Dendrochronologia, 30(2): 179-187. Myers-Smith, I., Forbes, B.C., Wilmking, M., Hallinger, M., Lantz, T., Blok, D., Tape, K.D., Macias-Fauria, M., Sass-Klaassen, U., Lévesque, E., Boudreau, S., Ropars, P., Hermanutz, L., Trant, A., Siegwart Collier, L., Weijers, S., Rozema, J., Rayback, S.A., Martin Schmidt, N., Schaepman-Strub, G., Wipf, S., Rixen, C., Ménard, C., Venn, S., Goetz, S., Andreu-Hayles, L., Elmendorf, S., Epstein, H.E., Welker, J., Grogan, P. and Hik, D. (2011) Shrub expansion in tundra ecosystems: Dynamics, impacts and research priorities. Environmental Research Letters, 6(045509). Nairn-Birch, N., Diez, D., Eslami, E., Macias-Fauria, M., Johnson, E.A. and Schoenberg, F.P. (2011) Simulation and estimation of probabilities of phases of the Pacific Decadal Oscillation. Environmetrics, 22(1): 79-85. Forbes, B.C., Macias-Fauria, M. and Zetterberg, P. (2010) Russian Arctic warming and 'greening' are closely tracked by tundra shrub willows. Global Change Biology, 16(5): 1542-1554. Helama, S., Läänelaid, A., Tietäväinen, H., Macias-Fauria, M., Kukkonen, I.T., Holopainen, J., Nielsen, J.K. and Valovirta, I. (2010) Late Holocene climatic variability reconstructed from incremental data from pines and pearl mussels - a multi-proxy comparison of air and subsurface temperatures. Boreas, 39(4): 734-748. Helama, S., Macias-Fauria, M., Mielikäinen, K., Timonen, M. and Eronen, M. (2010) Sub-Milankovitch solar forcing of past vlimates: Mid and Late Holocene perspectives. Geological Society of America Bulletin, 112(11/12): 1981-1988. Macias-Fauria, M., Grinsted, A., Helama, S., Moore, J., Timonen, M., Martma, T., Isaksson, E. and Eronen, M. (2010) Unprecedented low twentieth century winter sea ice extent in the Western Nordic Seas since A.D. 1200. Climate Dynamics, 34(6): 781-795. Macias-Fauria, M., Michaletz, S.T. and Johnson, E.A. (2010) Predicting climate change effects on forest wildfires requires linking processes across scales. WIREs Climate Change, 2(1): 99-112. Helama, S., Nielsen, J.K., Macias-Fauria, M. and Valovirta, I. (2009) A fistful of shells: Amplifying sclerochronological and palaeoclimate signals from molluscan death assemblages. Geological Magazine, 146(6): 917-930. Macias-Fauria, M. and Johnson, E.A. (2009) Large-scale climatic patterns control area affected by mountain pine beetle in British Columbia, Canada. Journal of Geophysical Research, 114(G01012). Macias-Fauria, M. and Johnson, E.A. (2008) Climate and wildfires in the North American boreal forest. Philosophical Transactions of the Royal Society B, 370(1663): 2317-2329. Macias-Fauria, M., Helle, T., Niva, A., Posio, H. and Timonen, M. (2008) Removal of lichen mat by reindeer enhances tree-growth in a northern Scots pine forest. Canadian Journal of Forest Research, 38(12): 2981-2993. Andreu, L., Gutiérrez, E., Macias-Fauria, M., Ribas, M., Bosch, O. and Camarero, J.J. (2007) Climate increases regional tree-growth variability in Iberian pine forests. Global Change Biology, 13(4): 804-815. Macias-Fauria, M. and Johnson, E.A. (2006) Large-scale climatic patterns control large lightning fire occurrence in Canada and Alaska forest regions. Journal of Geophysical Research, 111(G04008). Macias-Fauria, M., Andreu, L., Bosch, O., Camarero, J.J. and Gutiérrez, E. (2006) Increasing aridity is enhancing Silver fir (Abies alba Mill.) water stress in its south-western distribution limit. Climatic Change, 79(3-4): 289-313. Macias, M., Timonen, M., Kirchhefer, A.J., Lindholm, M., Eronen, M. and Gutiérrez, E. (2004) Growth variability of Scots Pine (Pinus sylvestris) along a west-east gradient across Northern Fennoscandia: A dendroclimatic approach. Arctic, Antarctic and Alpine Research, 36(4): 565-574. 'Reconstats' calculates the significance of dendroclimatic reconstruction statistics based on simple and multiple linear regressions.